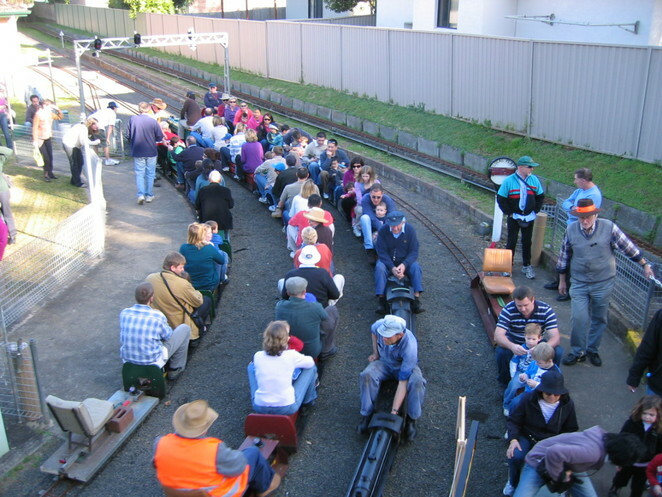 Miniature Steam Train Rides at West Ryde, on the 3rd Saturday of every month. 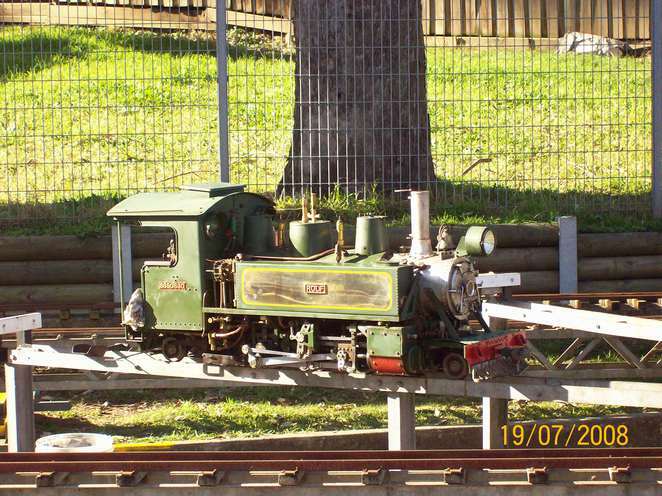 Founded in 1948, The Sydney Live Steam Locomotive Society of Australia, (SLSLS), is one of the oldest Miniature Steam Societies, that continue to run today. The Members of SLSLS own and run their steam engines for us to enjoy their passion. Members have built these engines themselves, but on a miniature scale. Steam train enthusiasts will be inspired with the workmanship. 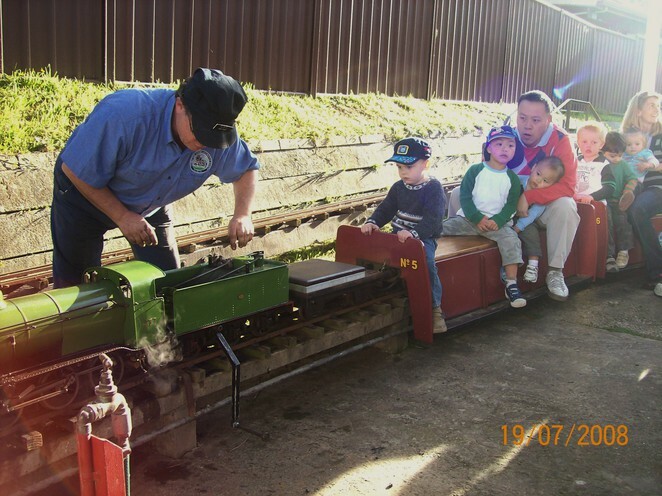 They run the miniature locomotives, on a 5 1/32" gage track, you can talk more about this to the members on the day, they are very approachable. This entire area has been built by the Society Members. They have created and laid their track in a park like venue, which incorporates going under bridges (the bridges are great for photo opportunities). One of the bridges that I'm aware of is unmistakably similar to the Hawkesbury River Bridge. They have created different tracks to suit varied locomotives, some drivers run single carriage, the majority operate with 6 carriage cars seating approx 30. At stages, you feel you might tip and just watching people lean instinctively is a sight in itself. The design and choice of the engines on individual tracks prevent this from happening. The tracks have stub points and throw over lever systems (manual moving of the points on track) and even a signal box and maintenance area. Guards ride on the rear of the carriage and stations have been created at variable sections through out this wonderful venue. I've seen the drivers with a pot of water, and yes occasionally the train stops to put out a track fire due to embers from the train in front. Some do running repairs or refuelling and water stops. Keep an eye out for the railway memorabilia that is displayed around the entire area. Let the children of today experience a touch of what some of us were privie to growing up. Steam, coal, cinders raining down on you, the chugging sound and smell. I don't know who will be more intrigued, the kids or the adults. Being close enough to admire the tedious task at hand, the members have a maintenance area where you can watch and learn as they tinker with their Locomotives. Red light indicates yes you guessed it stop. Yellow light at your next signal you must stop at the station. Yellow flashing light, at the next signal stop. Yellow row of lights. at the next signal stop and go left. Yellow row of lights, do not stop at next signal however go to left track. Yellow lights are for shunting. Green obviously we all know that one - GO. Guard Indicator on the Station waves the White Flag waves if platform is clear. This indicator system is still used with the modern electric trains that we catch everyday. In the centre is a Kiosk which sells cakes, drinks, hot dogs and ice cream and the odd souvenir. Have lunch in the open area (fenced off to the track) where you can picnic, bring a rug, chairs, no alcohol is allowed. You may like to sit under the Alder tree during hot days. Party or group hire is available for further information, please visit The Sydney Live Steam Locomotive Society's' website. Fully enclosed shoes (no exceptions), and follow all safety rules. The owner drivers are allowing us the privilege to experience locomotive at its best. Advisable not to wear white, these are real steam locomotives Don't forget your chair/rug as seating is limited (there is no shelter apart from trees here and it can get cold and windy). Sydney Live Steam Locomotive Society is on the corner block of Anthony Road and Betts Street, West Ryde. It is a 3 minute walk from West Ryde Railway, and just behind the carpark of West Ryde Marketplace. Time limits apply for parking. Because its run by volunteers it is only open on the 3rd calendar Saturday of each month. Between 1.30pm and 4.30pm. Entry is $2.00 for adults and $1.00 for children, this obviously goes to the upkeep and is a totally inexpensive day out for the family. Rides are $1.00 per ride. Rainy days and total fire bans, please check with the SLSLS website for advice.